He received the PhD degree in signal processing and telecommunications from University of Rennes 1 in 1995. From 1995 to 1997, he was an INRIA (French National Institute for Research in Computer Science and Control) expert-engineer in the TEMIS research group (IRISA/INRIA Rennes, France). In 1997, he was appointed at INRA (French National Institute for Research in Agronomy) in the MIA - Applied Mathematics and Computer Science Department as a full-time research scientist in Jouy-en-Josas, France. 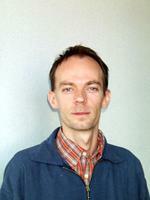 Since September 2003 he is on INRIA secondment (INRIA Rennes - Bretagne Atlantique, France). Since 01/01/2010, he is head of the SERPICO (Space-TimE RePresentation, Imaging and cellular dynamics of molecular COmplexes) Team (INRIA Rennes - Bretagne Atlantique) in collaboration with Institut Curie (UMR 144 Cnrs, Paris), France. J. Boulanger, Ch. Kervrann, P. Bouthemy, P. Elbau, J.-B. Sibarita, J. Salamero. Patch-based non-local functional for denoising fluorescence microscopy image sequences. IEEE Trans. on Medical Imaging, 28(12), 2009. J. Boulanger, Ch. Kervrann, P. Bouthemy. A simulation and estimation framework for intracellular dynamics and trafficking in video-microscopy and fluorescence imagery. Medical Image Analysis 13: 132-142, 2009. J. Boulanger, Th. Pécot, P. Bouthemy, J. Salamero, J.-B. Sibarita, Ch. Kervrann. Simulation and estimation of intra-cellular dynamics and trafficking. In Microscopic Image Analysis for Life Science Applications , S. Wong, R. Machiraju, J. Rittscher (eds. ), Chap. 7, pp. 169-190, Artech Publishing House, 2008. Th. Pécot, Ch. Kervrann, S. Bardin, B. Goud, J. Salamero. Patch-based Markov models for event detection in fluorescence bioimaging. In Proc. Int. Conf. on Medical Image Computing and Computer Assisted Intervention (MICCAI'08) , Volume 2, Pages 95-103, New York City, USA, September 2008. J. Boulanger, J.-B. Sibarita, Ch. Kervrann, P. Bouthemy. Non-parametric regression for patch-based fluorescence microscopy image sequence denoising. In Proc. IEEE Int. Symp. on Biomedical Imaging: from nano to macro (ISBI'08) , Pages 748-751, Paris, France, May 2008. Th. Pécot, Ch. Kervrann, P. Bouthemy. Minimal paths and probabilistic models for origin-destination traffic estimation in live cell imaging. In Proc. IEEE Int. Symp. on Biomedical Imaging: from nano to macro (ISBI'08) , Pages 843-846, Paris, France, May 2008. Th. Pecot, J. Boulanger, Ch. Kervrann, P. Bouthemy. Network tomography for trafficking simulation and analysis in fluorescence microscopy imaging. In Proc. Int. Symp. on Biomedical Imaging (ISBI'07), Arlington, USA, 2007. J. Boulanger, K. Kervrann, P. Bouthemy. Space-time adaptation for patch based image sequence restoration IEEE Trans. on Pattern Analysis and Machine Intelligence , 28(6):1096-1102, 2007. C. Kervrann, J. Boulanger. Optimal spatial adaptation for patch-based image denoising . IEEE Trans. on Image Processing, 15(10):2866-2878, 2006.